— The efficiency gap is a way to measure whether one party receives disproportionately more or fewer U.S. House seats compared to their share of the national House popular vote. — In the 1970s and 1980s, the Democrats generally won a greater share of seats than their total vote would have indicated. Since the mid-1990s, that Democratic advantage has morphed into a Republican advantage. Redistricting for the U.S. House of Representatives is not a unified process, as is the case for most national legislatures, but rather the result of the cumulative actions in the states that have more than one representative. Nevertheless, it is useful to look at the entire House to see how the decisions in the states combine to form a fair or biased playing field for the parties. The traditional method for analyzing the partisan nature of the redistricting process is the seats/votes relationship, i.e. the link between the share of the national vote a party receives and the share of the seats it wins as a result (see here for a longer discussion). For this analysis, simple least squares regression is used to relate the percentage of the two-party votes that the Democrats received to the percentage of the seats they won over some period of time such as a redistricting cycle. One can determine partisan bias by simply solving the regression equation for a situation in which the Democrats received 50% of the votes. At that level, they should also receive about 50% of the seats if the playing field is level. I do not think the courts should accept an arbitrary limit of this kind. Instead, the courts should follow the procedures outlined by Jowei Chen and others. A computer using Geographic Information System technology can draw thousands of alternative plans using the same traditional districting principles as a challenged congressional map but without partisan data. If the bias in the challenged plan (by whatever measure) is greater than 95% or 99% of the bias in the computer-drawn plans, the courts could conclude that the plan is a gerrymander with a certainty equivalent to the .05 or .01 level of statistical significance. Determining the percentage of the two-party votes received by Democratic candidates for the House requires attention to two questions. The first is how to count elections in states that have majority vote requirements with runoff elections after November, and/or elections in which all the candidates in the November general election are in the same party as in the jungle-primary system used in California. If the candidates in the final election are both in the same party or only one major party had candidates in the general election, I counted the contest as unopposed for that party. There were nine November elections in California in 2016 in which either both the final candidates were Democrats or a Democrat faced an independent candidate. A second question is what to do with these unopposed contests. I define an opposed contest as one in which there was both a Republican and a Democratic candidate in the November election. If the vote in unopposed contests is included, the total for the party that had the most unopposed candidates is inflated, because their opponents would have received at least some votes. If the vote of the unopposed candidates is excluded, the vote of the party with the most unopposed candidates is understated because unopposed candidates would undoubtedly receive a substantial majority of the votes if they were opposed. It is reasonable to count the handful of elections in California that lacked two-party competition as unopposed for my calculations. The two-party voter turnout in unopposed districts is assumed to be equal to the mean turnout in opposed contests. This is designated as m in the formula. This is a reasonable assumption as Robert Huckfeldt et al. report. Gary Jacobson estimates the percentage of the vote that we would expect unopposed candidates would have received, on average, if they had been opposed (v in the formula) at 71% with a standard deviation of 10%. His analysis is based on the support that congressional candidates received in the election following or preceding the one in which he or she was not opposed. With this calculation I derived the percentage of the two-party vote that the Democrats received in recent elections. These figures deviate little from other measures of the “total vote” without this adjustment. Over the years, I have collected the data from a variety of reliable sources, most commonly the Clerk of the U.S. House. The data for 2016 comes from the Cook Political Report. The logical place to start the analysis is with the 1972 election, which is the beginning of the first redistricting cycle after the U.S. Supreme Court required Congressional districts to follow the one-person, one-vote rule. Table 1 shows the efficiency gap for each election from 1972 through 2016. The mean efficiency gap for each redistricting cycle can be compared to the bias for that cycle using the traditional seats/votes method. (I analyzed the seats/votes relationship for this period in the Crystal Ball back in January 2017.) Also provided is the absolute value of the efficiency gap by redistricting cycle and the totals for the entire 1972-2016 era. Figure 1 shows these efficiency gap figures graphically, while Figure 2 shows the absolute value of the efficiency gap for each election. Some elementary statistics are also provided in these figures. Perhaps the first thing to notice is that the efficiency gap is never close to seven. The highest efficiency gap is 5.51 in 1976. The efficiency gap was consistently positive — indicating a bias in favor of the Democrats — until 1996. Since 1996, the figures are all negative — indicating Republican bias — except in 2010 when the efficiency gap was almost zero (0.11). The changes between census cycles in the efficiency gap and the seats/votes bias are similar. The 1970s and 1980s were periods of Democratic bias. The 1990s were a balance, while the two most recent cycles show a Republican bias by both measures. 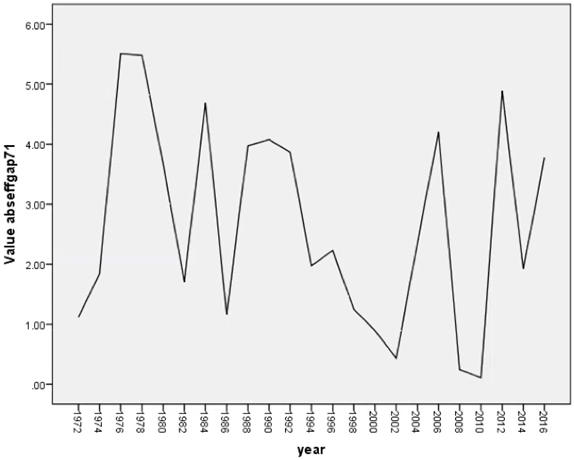 But why should the change come in the middle of the 1990 cycle? Figure 1 shows graphically how dramatically the efficiency gap moved from a Democratic to a Republican bias in 1996. 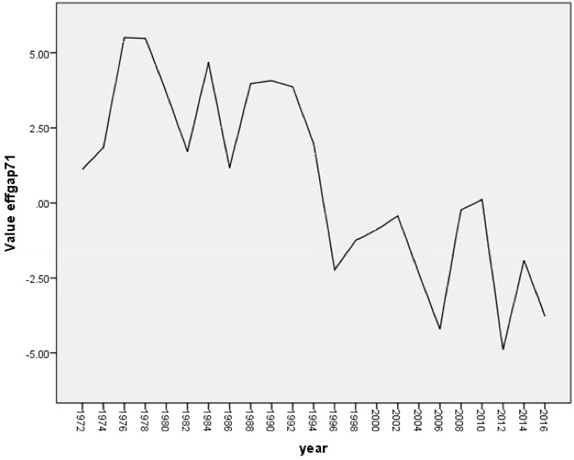 There is a strong Democratic period (prior to 1996) and the strong Republican period more recently. Within each period, the efficiency gap varies a little from election to election. The slope of the regression line is -.36, but Figure 1 clearly shows two very different periods rather than a consistent change over time. We should also be interested in whether the bias is increasing or decreasing without regard to which party is favored. Figure 2 shows the absolute value of the efficiency gap over the entire 44-year period. There is not really much change in the absolute value of the efficiency gap over time, as indicated by an R2 of .05 and a slope of the regression line of only -.06. This would indicate a very slight unreliable and irregular reduction in bias over time. The seats/votes bias would suggest the same thing. 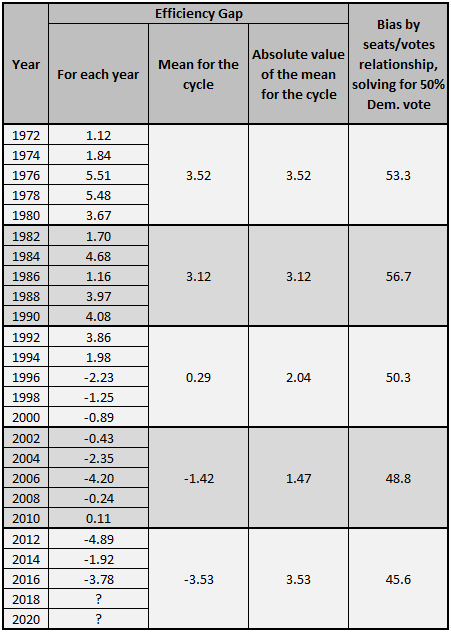 The Democratic bias in the early cycles is somewhat greater than the Republican bias in the two most recent cycles. The variation in the efficiency gap from election to election within the same decade is of concern. Some scholars and expert witnesses in redistricting litigation advocate measuring bias using the results of the first election in the legislative districts held under the new plan. If the efficiency gap varies this much from election to election, the results of this one election may be unreliable. This is, in part, why I have suggested that partisan bias (by whatever measure) should be based on a normal partisan vote data from jurisdiction-wide elections during the previous redistricting cycle. Use of the data from the first election under the new plan is also unreliable because the campaigns will shape the efficiency gap. The partisan nature of the new districts will shape the campaigns (quality of candidates, financing, etc.) in such a fashion as to increase the efficiency gap. Theodore S. Arrington is Emeritus Professor of Political Science at the University of North Carolina at Charlotte. He has been an expert witness in over 40 voting rights cases in the United States and Canada, and his commentary is frequently cited in the press.